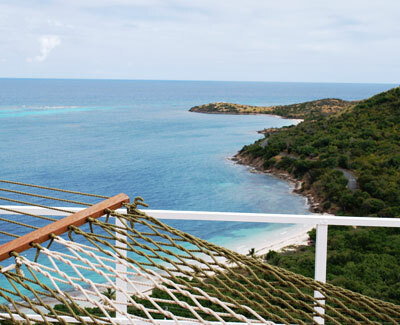 Smugglers Retreat commands a sweeping view of St. Croix's east end, Buck Island and the Caribbean Sea. Colorful tropical terraced landscaping surrounds this very private home and pool. As you step onto the walk way to the house, you know something special awaits--the start of a perfect vacation! Entering the great room with it's flat screen TV, and comfortable mahogany couches, the blues of the Caribbean Sea catch your eye. A small dining area shares the great room. Step out on the wrap around deck and take a look down on the palm trees lining the white sand beach; it's a picture postcard view. Bedroom 2 is directly to the right of the great room. This room has 2 twin beds which can easily be made up as a king. The master Bedroom is on the left or the house and overlooks the pool. This room has a king bed. Bedroom 3 is on the lower lever and very private. This room has a King bed, mini fridge and large deck to enjoy the views. The most outstanding thing about Smugglers Retreat are the dramatic views from everywhere--the bedrooms, pool and decks. A special spot is the hammock, perfect for sunning and relaxing.